About 6 to 7 smaller leeks, cleaned, thoroughly washed & pad dry with kitchen paper, each cut into smaller strips about 5 to 6 cm each ( with about 10 cm of the green attached ), in total 585 gr, weighted when cut into smaller strips!! 1. A few hours before dinner, heat a large cooking pot with hot water. Bring to the boil. When boiling, add the strips of the leeks. Blanch the strips in salted boiling water for about 2 to 3 minutes. Drain well. When cold, squeeze most of the liquid out. Place into the fridge. 3. Now, boil your potatoes until cooked through. Drain well. Place the cooking pot again on the hot stove & let the steam go away. Then, off the fire, mash the potatoes. I always add a bit of baking margarine, the chopped chives, grated fresh nutmeg but noo much, some Maldon sea salt flakes & a few grinds of black pepper. It has to taste fab! 4. When the potatoes are 5 minutes cooked, prepare the leeks. In a bigger bowl add the drained leeks, add the 2 remaining tablespoons of the lemon juice & add 2 tablespoons of the fruity EVOO. Add some grinded black pepper too. Mix it well together. Place in the bottom of a large oven dish & divide evenly, all over the base of the dish. Now, place the marinated salmon fillets, on top of the leeks. Pour the marinade all over the top of the fish & the leeks. Place in the bottom of the preheated oven & bake for about 13 to 15 minutes until the salmon fillets are just cooked through & it all looks succulent!!! 5. 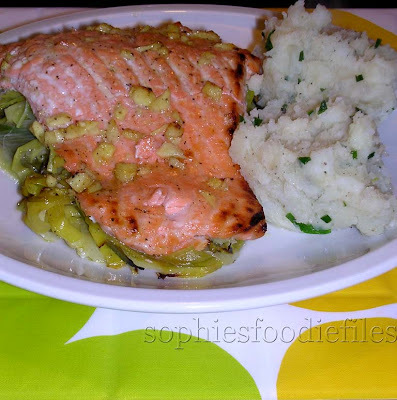 When you are going to plate up, lay a bed of leeks in the middle of your plate & carefully place a fish fillet on top, add a few tablespoons of the mash besides the fish! Spoon the juices of the oven dish all over the fish of the 2 plates. Enjoy with a lovely red Pinot noir on the side!